Looking for a Wonderful POOL Home under $280,000? Look no further! To fully appreciate this wonderful property, click on the "tour buttons to view the 3-D and Video tours. This 2/2 Baja Block/Stucco Courtyard Villa has a Fabulous SOLAR HEATED POOL and is being offered TURNKEY... and there is NO BOND! Just 1 BLOCK to SPANISH SPRINGS in the Village of DEL MAR, this beautifully decorated home is loaded. The beautiful glass entry door brings in natural light as you enter the home with TILED Floors throughout. The Kitchen has been totally redone with SILESTONE COUNTERS, SS Appl., TILED BACKSPLASH, SOFT-CLOSE CABINETS & PULL-OUT Shelves! The Master Suite has a Spacious CUSTOM Walk-in Closet, Private Bath w/Shower & Cultured Marble. The Guest Room is perfect for the occasional guest w/a separate Bath and Tub/Shower Combo. Flowing seamlessly from the Living Room is a CLIMATE CONTROLLED FL Room/Encl. 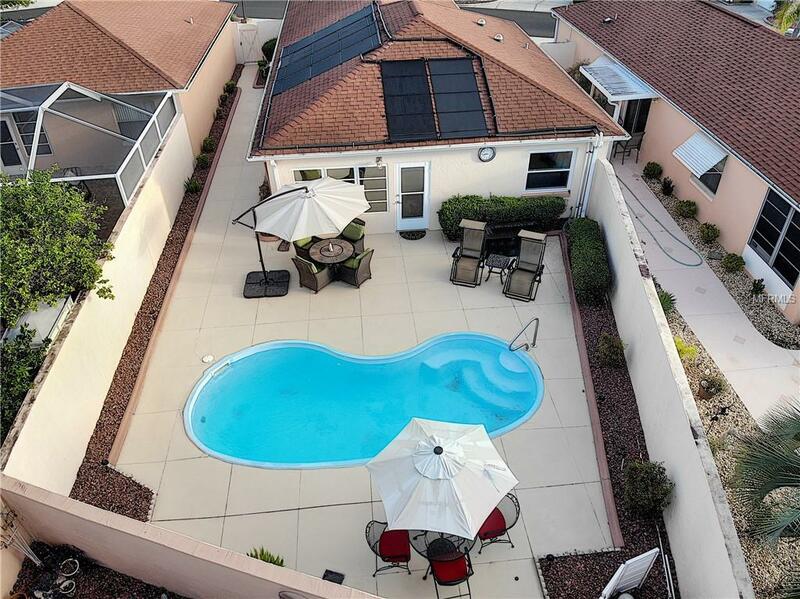 Lanai which leads to the Beautiful Pool & Large deck with high walls for complete PRIVACY. Youll love the LOW (almost no) MAINTENANCE YARD. Many extras include DUAL-PANED WINDOWS, ELECTRIC GARAGE DOOR SCREEN, EXTRA INSULATION OVER THE ENTIRE HOME & GARAGE, ANDERSON STORM DOOR, LED LIGHTS, 6-PANEL DOORS and CELLULAR SHADES. There are alco 2 Solar Tubes and a Privacy door to the Guest Suite. Want more? The A/C was replaced in 2012, Compressor in 2017, Water Heater in 2013, the home has Architectural Shingles, and the Exterior was Repainted in 2018. This amazing home has so many extras - must see for yourself!